This week’s Spoonflower design contest is to create a Mod wallpaper design, using only 3 colors (plus black or white optional). When I was a teen, I had one wall of my bedroom papered with an op art design (much like this one by Alberto Biasi), and though I’m not sure it fits in the Modernist Subculture, I decided to go with an op art inspiration for my design. I started by creating a simple grid of circles. Then, using the Adobe Illustrator distort options, I played with different options. Spoonflower and Robert Kaufman Fabrics are sponsoring a fabric design contest with the theme being “Geek Chic”. As a chemical engineer in a previous life, I have a lot of practical experience with geeky things, so I had tons of design ideas to start with. I thought I’d do something with chemical symbols, but I couldn’t come up with anything that seemed like an interesting design. I drew a number of geeky accoutrements, including the ties, test tube, sneaker and glasses below. Spoonflower’s weekly design contest theme is “Sailing” and I immediately knew I wanted to use the Notan design I wrote about in this post. That design used 4 different sail boat-inspired patterns (on the left below), combined Nolan-style into the 16 blocks on the right. Another week, another Spoonflower fabric design contest. The theme for this contest is Painted Eggs. I thought I’d create a bunch of 3-dimensional eggs and ‘paint’ them with some of my other fabric designs. First, here’s how I created a 3d egg in Adobe Illustrator (version CS5). 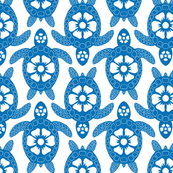 Another week, another Spoonflower fabric design contest. The theme for this contest is Australian Animals. So many great options it was hard to pick — kangaroos, wombats, koala bears, emu, platypus, Tasmanian devils… I googled Australian art and was inspired by the Aboriginal dot paintings. I thought I’d try a modern take on the dot paintings using kangaroos and geckos. I’ll go through the technique I used in Adobe Illustrator to create the multicolored animals. I started by drawing outlines of a gecko and a kangaroo. I wanted to keep the outlines pretty simple since there would be a lot of detail inside each animal. Another week, another Spoonflower design contest. This one is in partnership with the publishers of the series of books called One-Yard Wonders — sewing books with projects you can make with one yard of fabric. They’re putting together a new book aimed at projects to make for children. The contest was to design a girl’s tee shirt with the theme “Under the Sea”, and the winning design will be in the new book. The pattern for the tee shirt was provided. For this week’s fabric design contest Spoonflower partnered with the Nasher Museum of Art at Duke University with the theme of designing a textile that would look at home in a Matisse painting. They included these examples as inspiration.